This is the Auburn AUghts, the WBE series looking back at the decade that was in Auburn Tiger football. Today: the top 20 players of the last 10 years. Previously: the Plays. We’ll continue over the next 2 weeks or so with lists of various sizes and a couple of columns dedicated to the Auburn teams, games, coaches, and more that made the AUghts one of Auburn’s strongest decades in its 100-plus years of football. Enjoy. Selecting 20 players out the dozens of Auburn contributors over this past decade was hard. Way hard. Because so many comparisons were apples-to-oranges and no way around it: what’s more impressive, Rudi Johnson’s single phenomenal year at running back or Sen’Derrick Marks’ three solid years on the defensive line? What was more valuable, Ben Nowland’s long-term leadership at center or Damon Duval’s game-winning heroics at placekicker? What statistic matters more, that Ben Tate finished as Auburn’s fifth-leading rusher all-time or that Quentin Groves tied for the Auburn all-time sack record? You get the picture. In the end, I mostly went with the ol’ gut and its combination of who I felt was best, who I felt was most memorable, who contributed most for the longest, and who just plain helped shape this Auburn decade for the better. Your suggestions and/or complaints in the comments section are–as always–beyond welcome, since I’m sure I’m forgetting/ignoring a ton of people I shouldn’t be. 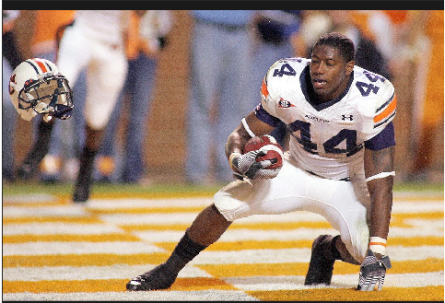 1a., 1b., RB Carnell “Cadillac” Williams (2001-2004), RB Ronnie Brown (2000-2004). I tried to avoid the cop-out of splitting the top spot, honestly I did. A lot of my holiday travel–in the car, in the airport, on planes–was spent pondering the best way to differentiate between the two of them. Hard as it is to differentiate between legends, the rules of list-making seemed to dictate that I pick one or the other. So: do you go with Ronnie’s all-around skill set and his durability? With Cadillac’s explosiveness and tenacity? With Ronnie’s power? With Cadillac’s charisma? Do you knock Cadillac for his injury history? Do you knock Ronnie for the fact that when both were healthy, two different offensive coordinators gave Cadillac the greater number of carries? How do you weigh Cadillac’s advantage in stats vs. the fact that–in my humble opinion–he was never quite as dominant a player as Ronnie was as the close of the 2002 season? So: in the end, I don’t think you differentiate between them at all. Neither one is what he became for Auburn without the other; we don’t remember either alone anything remotely like the way we remember Cadillac and Ronnie. We’re talking about Auburn here, Running Back U. This is the position where everything for our football program begins, and that was just as true for that 2004 team as it has been any other year (including their seasons in 2001, 2002, 2003.) And that incredible team didn’t begin with either one of these incredible players–it began with them both. Both of them deserve to be No. 1 on this list, and so that’s where I’ve got them. 3. QB Jason Campbell (2001-2004). He finished that game–arguably the biggest of the season–27-of-35 for 374 yards and 3 TDs, with 57 yards rushing just for good measure. But maybe the greatest thing about that performance was that by then, we expected it. Campbell’s numbers for the year are off the charts: 188-for-270 (69.6 percent), 2,700 yards even, 10 yards per attempt, 20 TDs to 7 INTs, a 13-0 record. No Auburn quarterback in my lifetime has had a season anything like that, almost no quarterbacks anywhere* have had a season that combines that kind of efficiency (viz. the completion rate) with that kind of big-play ability (viz. the YPA), and no other Tiger player this decade reached the level of greatness Jason Campbell did in 2004. That simple. *Seriously: according to cfbstats.com, whose database goes back to 2004, Louisville’s Stefan Lefors (also in 2004) is the only other quarterback of the past six years to reach double-digits in YPA while completing 70 percent of his passes. 4. 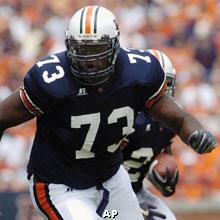 OT Marcus McNeill (2002-2005). Consider: between 2004 and 2005, all three of the above players graduated, one of them to be replaced by Brandon Cox, but Marcus McNeill returned. And the Auburn offense took only a minor step backwards. Between 2005 and 2006, Marcus McNeill graduated, while Cox and Kenny Irons and nearly every other non-receiver player on the offense returned. And the offense fell off a cliff. I think that–and the numerous All-SEC, All-American, etc. honors–is pretty much is the best way to illustrate the impact and talent of the best lineman (offensive or defensive) Auburn produced this decade. Offensive tackles are never going to speak to our souls the way running backs or quarterbacks do, but McNeill was every bit as skilled–and arguably every bit as important to Auburn’s fortunes–as the three players above him on this list. 5. CB Carlos Rogers (2001-2004). 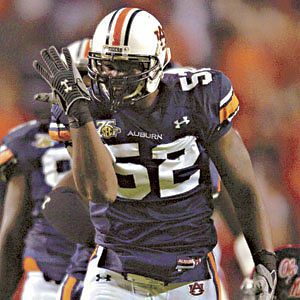 For my money, there’s really only one candidate for the most dominant individual defensive performance of the decade by an Auburn player: Carlos Rogers, vs. Georgia, 2004. It’s usually a bad sign when your corner leads the team in tackles (since it means they’re not breaking up passes tossed in their man’s direction), but when Rogers led the Tigers with eight stops against the Dawgs, it was just because Rogers was as close to being literally everywhere on the field as any player I’ve ever seen. He finished the game with not only the eight tackles but two TFLs, one sack, and one critical pick in the end zone. He was unstoppable that day. And that’s a big part of why he wound up as Auburn’s only player this decade to win a national award, taking home the Thorpe in 2004. But beyond the acclaim or Rogers’ stunning consistency (he started 9 or games all four years he was at Auburn), there was the simple fact that that 2004 unit finished No. 1 in the nation in scoring defense … despite the fact the next-most recognizable starter was … ummm … Tommy Jackson? Junior Rosegreen? Jay Ratliff? Travis Williams? Awesome players all, certainly, but there was no question then and there’s no question now who was the single biggest weapon on that defense. 6. LB Karlos Dansby (1999-2003). You don’t need any more examples of how big a dork your humble Auburn Blogger is, but it still seems worth mentioning that back in 2001 a buddy of mine and I were watching Dansby tear some poor punching bag to shreds and decided he ought to be nicknamed “Hopper”–you know, after the grasshopper villain from A Bug’s Life. Now here’s the really embarrassing part … I still think the nickname fits. We initially picked it just because Dansby was–like Hopper–tall and rangy, but it stuck with me over the next two years of Dansby’s career because of how violent his style of play could be, how big a hitter he was, how constantly disruptive and intimidating and terrifying he must have been for opponents. To opposing offenses, he must have seemed like a cartoon villain, right? And in the end, I can’t think of another Auburn defender from this decade with his combination of athleticism, power, and speed. He was a terror, through and through. 7. Quentin Groves, DE (2003-2007). It’s one thing for Groves to have finished his Auburn career having tied with Gerald Robinson for the most sacks all-time in school history. That alone would have him pretty high up this list. I’m not sure if that totally made up for his midseason injury and admission that he’d ignored defensive orders to chase the sack record … but it comes close. So Simmons only played two years in the Aughts, and he played them on the offensive line, quite possibly the least glamorous position on the entire field. It doesn’t much matter when you make consensus first-team All-SEC both of those years, pave the way for one of the all-time great seasons by a running back (see below) and a divisional title, and emerge as the strongest member of a dominant 2000 line also featuring the likes of Monreko Crittenden and Ben Nowland. You can make an argument for Coleman ranking this high on his stats and honors alone, easily: his 24.5 career sacks (third-most all-time behind only Groves and Robinson), his back-to-back first-team All-SEC selections, his SEC-leading sack/TFL total in ’09 despite wearing a cast half the year, his three consecutive seasons spent leading Auburn in both sacks and TFLs. But the most memorable moment of Coleman’s career, in my book, didn’t even come on the football field–it happened about this time last winter, when fellow defensive stars Jerraud Powers and Sen’Derrick Marks were in the process of leaving the listing Auburn ship for the NFL rather than take a chance on the Gene Chizik era, recruits were fleeing, the nation was laughing … and Coleman decided he’d come back and play his senior season for Auburn’s new coach. 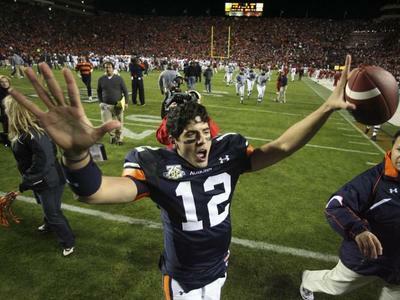 It’s been nothing but good news for Auburn since. I’ve already written a sonnet about him. 11. Brandon Cox, QB (2003-2007). Yeah, yeah, hate all you want. Dude won 20 games in two years, finished 29-9 as a starter, beat ‘Bama 3 times out of 3, beat Florida 2 times out of 2 (outplaying Leak the first time and Tebow the second), finished in Auburn’s all-time top five for career yardage (third), completions (third), completion percentage (fourth), and TDs (third), and was generally as clutch as clutch could get. And oh yeah, dude did it all battling a degenerative muscle condition and taking an ungodly pounding behind 2006’s underachieving line and 2007’s bunch of freshmen. When he wasn’t behind one of those lines and had non-walk-on receivers to throw to, all he did was help turn the 2005 offense into one of the most explosive unit’s Auburn’s ever had. Did we want more from Brandon Cox? Yes. Could he really have given us any more than he gave? Nope. As consistent a receiver as Auburn’s ever had, a four-year starter who finished with the Auburn record for career receptions, ranked fourth in yardage, and was the receiver-in-question for two of the biggest Auburn plays of the decade. Only one season at Auburn, but what a hell of a season: 324 carries, 1,567 yards (second-most in a season at Auburn), 13 touchdowns, 10 different 100-yard games, SEC Player of the Year honors. Finally, the Auburn running back had made its emphatic return. Thomas set the standard for Auburn’s long line of tackling machines to come, leading the team with 122 tackles in 2001 as a sophomore and eventually tag-teaming with Dansby for a one-two All-SEC linebacking punch. 15. Ben Nowland, C (1999-2002). The bridge between the dominant lines of 2000 and 2002, Nowland started 34 games at Auburn and was a Rimington finalist and consensus All-SEC player in 2002. Tre Smith’s big day–and, arguably, the entire 2002 upset– started with him. Like Rudi, essentially a one-season wonder–or, in his case, a three-quarters-season wonder–but that one season ranks amongst the most exciting in Auburn history (1,293 yards, 12 TDs, unanimous All-SEC honors). And as easy as it is to forget his disappointing injury-riddled 2006 season, we shouldn’t–Irons still picked up 941 yards in 10 games and posted the most impressive 70-yard performance I’ve ever seen in the 7-3 war against LSU. If Rogers was the star of that 2004 defense, Jackson was its engine, finishing fourth on the team in tackles (and leading the defensive line in stops) despite playing nose guard. There would be more of the same in 2005 (as he led the d-line in tackles again), but it wasn’t anything new–Jackson had already picked up nine TFLs as a freshman, good for third on the team. The Predator only played two years at Auburn and never became a full-time starter, since he only had one trick–crushing the quarterback. But holy hell, was that trick ever good: 7.5 sacks and 10 TFLs in 2004 (good for first-team All-SEC), 8 sacks and 13.5 TFLs in 2005. Aromashodu doesn’t have the career stats of some of Auburn’s other leading wideouts–he doesn’t crack the program’s top 10 in receptions, yardage, or touchdowns–but no Tiger receiver this decade provided a bigger big-play threat. Aromashodu’s 24 receptions in 2004 averaged a whopping gain of 21.38 yards, a number that dipped only slightly to 19 yards even in 2005. Stop with the snickering–if all you remember about Herring is his repeated gaffes at the end of the Tennessee and Va. Tech games in ’04, that’s a shame, because you should remember he a) started a school-record 49 consecutive games b) led the team in tackles for two straight years in 2005 and 2006 c) made second-team All-SEC both those seasons d) should have been playing linebacker the whole time. So other Auburn defenders might have been more athletically gifted (though not that many–Herring also wound up getting drafted in the fifth round, remember) or more prone to big plays; only a tiny select few contributed more to Auburn’s cause for longer than Herring. One quick Dansby memory: in the third quarter of the 2002 uat game, Heisman Watts ran an option play. It looked like Dansby bit, and if I recall correctly, he actually got a hand on Watts before Watts pitched out to Shaud “I’m Not Gay” Williams. Normally, you’d expect Williams to get a nice gain there, since the quarterback had apparently suckered the linebacker on the option. Except that Dansby adjusted in stride and tackled Williams–solo–for a loss. Never seen anything like it, before or since. i actually would rank Cox #7. dude was a winner, despite his many problems. also Junior Rosegreen would make my top 20 for the HIT alone. Tre Smith – RB – Auburn defenders would stand to watch how opposing teams tried to tackle him – they knew how hard it was. Trey Blackmon – LB – never saw anyone hit as hard as he did at the point of a tackle. By the way, check on all the choices in the top 20. I always felt the best measure of Cadillac was a block he threw on all-SEC DE David Pollack that both protected Jason on a rollout and sprung Ronnie on a F-back pass into the end zone. The play was picture perfect, and Pollack picked himself off the turf in disbelief at the ferocity of the hit. Between Caddi and Ronnie, I would take Ronnie first (and I love Caddi). I just think that Ronnie’s all around skill set made him the most dangerous weapon between the 2. I am glad to see that Will Herring made the top 20. He did every thing that was asked of him and then some. Same for Brandon Cox. I would like to have seen J. Powers at least get honorable mention. I think those first 11 players would be pretty unanimous for any Auburn fan (except I would switch out Kendall Simmons for Courtney Taylor and BTW that is a picture of Tyronn Greene). But after number 12, you could put them in pretty much any order. I definitely think Junior Rosegreen should be on there. 2004 All-American, four-year starter with 51! total games. I can’t definitively say who I would replace him with on your list, but he I think he should be on there. I also think Ben Grubbs deserves more than an honorable mention for being so solid for so long and for being an All-American. I’m starting to think this should have been a top 25 players of the decade. I’ll give honorable mentions to Karibi Dede (one of my favorites and a leader in 2006), Carl Stewart (another favorite and the man who perfected the wheel route), Reggie Torbor, and Zac Etheridge. The 2005 AU Offense was BETTER than 2004’s. True, the yards/game went down a tick, but AU went from #2 in the SEC in 2004 to #1 in 2005. That just means that the defenses in the conference got better. I think PPG went up from 04 to 05 as well, but I could be wrong. But I am quite sure we were #1 on the league there as well. This is the faulty logic that many use to deride Borges as a myth built merely on Ronnie/Carnell/Jason. And honestly, I don’t know that 2004 Campbell was better than 2005 Cox. If only 2006 and 2007 Cox were as good – boy howdy. Now if they want to say it was a myth built on those three PLUS The Unpronouncables and McNeil, then I can’t argue there because as you note things deteriorated drastically in 2006. We all know that Auburn is RB U. But for the Tuberville era at least, it was also DE U. To borrow a phrase from Jerry, there was an “endless chain of demons” at that position: McGlover, Grubbs, Groves, Coleman – now Carter is hopefully ready to step in. Hopefully Chiz can get the defensive swagger back and build some depth to create some more dominant defenses like the ones he coached here in 2002-2004. I have no problem with the list except to see Cox higher. Other than that I just want everyone to sit back, smile, and sigh at the amazing decade Auburn football just had! Gotta show some love for Brandon Johnson. Dude paved the way for Caddy and Ronnie, and played LB (or was it safety). He’s the last two-way player we had that actually played a key role on both sides of the ball. I’m glad to see Karibi Dede made the comments. I’m going to name something after that guy one day. In all seriousness I think one person (type) should be added to the honorable mentions, and it is made more obvious by its recent absence: Pick either of those kickoff specialists that could actually put the ball deep in the end zone and add them to the list. Especially in Tuberville’s win on the margin era those guys were WEAPONS. I couldn’t disagree more. Here’s how I see it.. When Caddy stepped on campus, he was Caddy. Carnell Williams didn’t need any other running back to provide competition in order to motivate him to improve himself or his game. Caddy did that (ALWAYS) because of who he was and the way he is. You could tell from his first carry that this kid GOT it. Now he learned over the years. Got better. Improved his game. But he had “it” from Day One. Ronnie Brown? Not so much. In 2000, he got 10 yards on six carries in his the first two games and red-shirted. NO instant impact. In 2001, Ronnie rushed for 330 yards and two TDs on 84 carries (3.9 ypc). What did Caddy do in 2001 (his true freshman year)? He rushed for 614 yards and 6 TDs on 120 carries (5.1 ypc). It is well known that the 2001 season lit a fire under Ronnie and he started working harder and longer to improve his game, much harder than he had the previous two years. What motivated him to do so? Carnell Williams. Two great Auburn running backs, absolutely. LOVE’EM both. But the Cadillac stepped on campus ready to roar (and, breaking Auburn records in single-season TDs and career TDs). It took a Cadillac running him over to motivate Ronnie Brown (and, to his credit, he stepped up to the challenge). 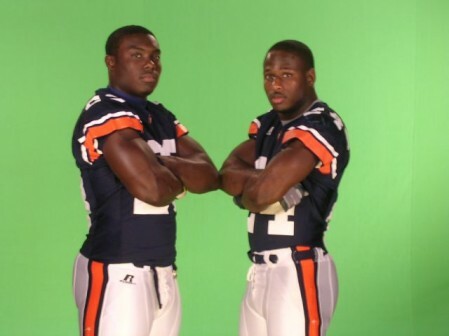 THAT’S the difference (Auburn record-holder) Carnell Williams and Ronnie Brown as Auburn players. There may not be a significant difference between the two and their contributions to the Auburn team. But there IS a difference… and that difference is to the Cadillac’s advantage. And oh, by the way… you have Tommy Jackson ranked WAY too low. Dude was a flat-out stud and mauler. But great work as usual, Jerry! Provocative list! Thanks! Jerry, I don’t think that picture is of Kendall Simmons. AUsome stuff as always…. I’m sure they’re out there somewhere but how bout the same type of list for the 80s and 90s? I was so glad to see Courtney Taylor on your list. I can’t remember him ever dropping a ball that was reasonably close. 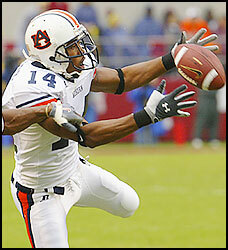 If Auburn needed a clutch catch, at a crucial point in the game, Taylor was there for the grab. Sounds like the season Darvin Adams just had, huh? Will, I gotta say man. I was scrolling down to post the exact same thing. That single-handed option-beater was the best defensive play of the decade that very few remember. Footage at the 1:35 mark. On an unrelated note. That D played with some serious swagger. Let’s bring that back, shall we? OK, the picture of Simmons is fixed, along with his position–he was playing LT, as it turns out. — Ben Grubbs was a tough call. I know he was an All-American, first-round draft choice, etc., but that 2006 line really should have been better than it was. I thought the top 20 ought to be reserved for guys who pretty much played to the peak of their abilities the entire time, and I don’t know if I’d say that about Grubbs. — You could flip a coin between Rosegreen (another late “cut”) and Herring. I went with Herring because 1) the starts record 2) ultimately I thought he was more critical to that 2006 team’s success than Rosegreen ever was to his teams’, but that’s obviously an extremely subjective measure. tiger7: I’d argue that it was Brown’s emergence in ’02 that drove Cadillac to come back from his injury with the fury that he did. I’d also argue that it was the terror and versatility that resulted from having them both on the field in ’04 that made that offense what it was. I’m fine with saying Caddi ought to get the No. 1 nod (obviously not the way I went, but I understand it), but I also don’t doubt that both players got a lot of their simultaneous presence on the roster. Hell, they even said as much at the time. Alex P: The 2005 offense scored at almost the exact same rate (32.2 PPG to 32.1), but averaged about 10 fewer total yards per game and saw its per-play average drop from 6.4 to 6 even. And sorry, even in ’05 Cox was not in the same ballpark with Campbell–2.5 yards fewer per throw, a huge dip in passer rating, and the flurry of picks that cost us the Ga. Tech game. I think it all adds up to a “minor step backwards,” yes. Chris, Will: thanks for the memory, and the clip. For the most part, I agree with the list. Focusing on the the Running Backs, I want to talk about Ronnie. Ronnie was great, but he didn’t do as much as the Cadillac. Not even close. I love Ronnie, but it shouldn’t be a split decision. I got a list of the top Auburn Running Backs online with stats. It breaks them down and includes Tate.